I can’t believe that I haven’t shared this with you before. It’s one of my go-to favorites on a hot sunny day when all I’m craving is the comfort of a little ice cream. It’s ridiculously simple and versatile, and if you’re following a low-carb high-fat diet already, you definitely have all the ingredients around the kitchen. On the surface, you may dismiss this as just flavored whipped cream, but I want you to open your mind for me. The fact that this uses real fresh heavy whipping cream, and can be flavored in an infinite number of ways, should command a little respect. Besides, once you taste this slipping down the back of your throat on a summer afternoon, you won’t be thinking about how simple it was to make. You’ll just be enjoying the flavor and the sensation. I start with about a third of a cup of heavy whipping cream in a wide rimmed mug. To that I usually add three drops of liquid Splenda, and about three drops of any kind of flavor extract I happen to feel like that day. If you’re feeling vanilla, go with a half teaspoon of vanilla. If you have some almond extract or lemon oil in the house, put in a few drops of those instead. Or mix and match flavors. You can also go crazy with food coloring. This is as white as white can get, so any color you want to add will go a long way. Have you tried the neon colors yet? Today I was feeling nostalgic for the old licorice ice cream I used to get at Baskin-Robbins 31 Flavors when I was a kid. They haven’t made it in years as far as I know, and even if they did, it would be so full of sugar I wouldn’t want it anywhere near me. But I used to love the fresh flavor of licorice mixed with the cool creaminess of the ice cream. A few drops of anise oil from a candy supply company, and I’m back in the ice cream parlor, standing next to my mother as she pays for the ice cream that’s dripping all over my fingers. This recipe couldn’t be easier. You can also try popping the finished mug into the freezer for ten minutes, to get a little more chill into it. What is carb on your recipes? As is not showed on them. You’re right, I don’t show carbs for the recipes. I find it’s usually misleading to say a recipe has a specific number of carbs because ingredients and measurements can vary so much in real life. Each of us needs to measure our own reactions to different foods. 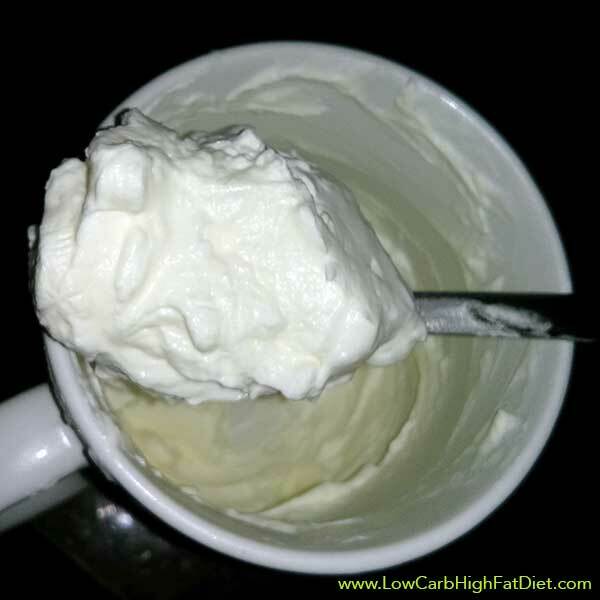 I focus on using low-carb high-fat friendly ingredients for all my recipes instead.